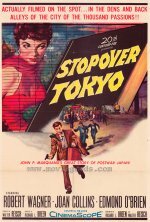 Screenwriter Richard Breen co-wrote the Oscar-winning script for 1953's Titanic and directed just one picture, this spy drama about double and triple-crossing in Tokyo. Robert Wagner is likeable but also a bit lightweight as the counter-espionage agent who may or may not be protecting the US Ambassador. Variety correctly pigeonholed it as a Mr Moto movie without Mr Moto - the Japanese detective hero of John P Marquand's novel was replaced by all-American hero Wagner.